In the last 50 years, there has been a tremendous advance in our understanding of the elementary particles and their interactions. We now have a mathematically consistent theory of the strong, electromagnetic, and weak interactions-the standard model-most aspects of which have been successfully tested in detail at colliders, accelerators, and non-accelerator experiments. It also provides a successful framework and has been strongly constrained by many observations in cosmology and astrophysics. The standard model is almost certainly an approximately correct description of Nature down to a distance scale 1/1000th the size of the atomic nucleus. However, nobody believes that the standard model is the ultimate theory-it is too complicated and arbitrary and leaves too many questions unanswered. Therefore, most current activity is directed towards discovering the new physics which must underly the standard model. One approach, exemplified by superstring theories, is to try to develop a "theory of everything". However, promising ideas involve incredibly short distance scales, and it is challenging to make contact with accessible energies at present. Another direction is to build larger accelerators to directly search for new particles and interactions, and much attention is focussed on the Large Hadron Collider (LHC), which is currently starting up. An important complementary approach is to subject the standard model to diverse high-precision tests to determine how good it is and where it might break down. Finally, there are probes from the important overlaps of particle physics with cosmology and astrophysics. All of these approaches are likely to be essential in understanding what underlies the standard model. It is my hope that within the coming decades we will be able to combine progress in these directions to develop and test the essential aspects of a new standard model of everything, which incorporates the microscopic interactions, quantum gravity, and the origin of the Universe, and describes Nature down to the Planck scale, ∼ 10−33 cm. My research has been directed towards the theoretical interpretation of the various experimental and observational probes, and the phenomenological implications of fundamental theories-i.e., in connecting theory and experiment. For over three decades much of my effort has involved the interpretation of high-precision tests of the standard model, and has exploited the fact that the global analysis of many experiments often yields more information than the individual experiments alone. Such global analyses involve collecting the data, deriving uniform and accurate theoretical formulas to interpret it, developing expressions for the possible effects of new physics, and fitting the data to search for or set limits on new physics. A related effort has been a study of the existing constraints, physics and cosmological implications, and the discovery/diagnostic potential at present and future colliders for classes of extensions of the standard model and its minimal supersymmetric extension, especially those types that frequently occur as theory-motivated remnants of specific superstring constructions. These include additional possible gauge bosons (especially heavy Z' s), extended Higgs/neutralino sectors, and exotic fermions (with non-standard weak interactions). Other recent work has involved possibilities for studying CP violation at the LHC and new methods for mediating supersymmetry breaking between the ordinary and a quasi-hidden sector. Other phenomenological areas in which I worked extensively in the past include chiral symmetry breaking and its consequences, and theoretical models for neutrino mass and their laboratory, astrophysical, and cosmological implications. In terms of more fundamental theory, I have had a long standing interest in grand unified theories and their consequences. More recently, I have become interested in the phenomenological consequences of semi-realistic superstring compactifications. My collaborators and I have examined classes of string constructions and specific models, with emphasis on their consequences for the masses of the quarks and charged leptons, standard and non-standard mechanisms for generating small neutrino masses, and the most likely types of observable new physics at the TeV scale. I have written an advanced textbook, The Standard Model and Beyond (CRC press, December 2009), a second edition (June, 2017), and a colloquium-level monograph Can the Laws of Physics be Unified? (Princeton University Press, March 2017). Senior Scientist/Lecturer, Princeton University, 2011-2018. Co-convenor, Workshop on Probing the TeV Scale and Beyond, Mainz Institute for Theoretical Physics, July 2014. Editorial Committee, Annual Reviews of Nuclear and Particle Science, 2012-2015. Co-convener, Workshop on First Two Years of the LHC, Kavli Institute for Theoretical Physics in China, Beijing, Summer, 2012. Co-convener, Workshop on Strings at the LHC and in the Early Universe, Kavli Institute for Theoretical Physics, Santa Barbara, Spring, 2010. Associate Editor, Reviews of Modern Physics, 2007-2013. Member, organizing committee for International Conference on High Energy Physics, Philadelphia, 2008 (ICHEP2008). Member, Organizing Committee, String Phenomenology, 2008, Philadelphia, May, 2008. 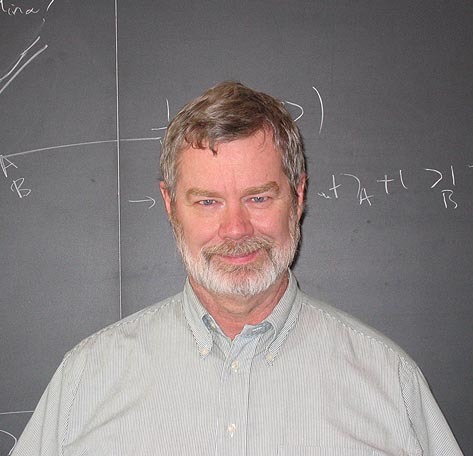 Chair, Steering Committee for the LHC Theory Initiative, 2006-2015. Member, HEPAP subpanel on the University Grants Program, 2006-2007. Member, High Energy Physics Advisory Panel (HEPAP) of the Department of Energy and National Science Foundation (2002-2005). Co-organizer, Aspen Winter Conference At the Frontiers of Particle Physics, 2003. Member, Steering Committee for SUSY conferences, 1998- . Light Quark Mass Spectrum in Quantum Chromodynamics (with H. Pagels), Phys. Rev. D19, 2070-2079 (1979). Magnetic Monopoles in Grand Unified Theories (with S.-Y. Pi), Phys. Rev. Lett. 45, 1-4 (1980). Grand Unified Theories and Proton Decay, Physics Reports 72, 185-385 (1981). A Comprehensive Analysis of Data Pertaining to the Weak Neutral Current and the Intermediate Vector Boson Masses (with U. Amaldi, A. Böhm, L. S. Durkin, A. K. Mann, W. J. Marciano, A. Sirlin, and H. H. Williams), Phys. Rev. D36, 1385 (1987). Unification of Two Fundamental Forces (with A. K. Mann), Physics Today 42, #12, p. 22 (1989). Implications of Recent MW,Z and Neutral-Current Measurements for the Top-Quark Mass, Phys. Rev. Lett. 63, 1920 (1989). On the Cosmological Production of Light Sterile Neutrinos, UPR-0401T. paper, or figure. High Precision Electroweak Experiments: A Global Search for New Physics Beyond the Standard Model (with M. Luo and A. K. Mann), Rev. Mod. Phys. 64, 87 (1992). Implications of Precision Electroweak Experiments for mt, rho 0, sin2theta W , and Grand Unification (with M. Luo), Phys. Rev. D44, 817 (1991). W and Z Physics, in TeV Physics, ed. T. Huang et al., (Gordon and Breach, Philadelphia, 1991), p. 53. Editor (with M. Cvetic) of Testing the Standard Model (Proceedings of TASI-90), (World, Singapore, 1991). Constraints on Additional Z Bosons (with M. Luo), Phys. Rev. D45, 278 (1992). Uncertainties in Coupling Constant Unification (with N. Polonsky), Phys. Rev. D47, 4028 (1993), hep-ph/9210235. Five Phases of Weak Neutral Current Experiments From the Perspective of a Theorist, Discovery of Weak Neutral Currents: The Weak Interaction Before and After, ed. A. K. Mann and D. B. Cline, AIP Conference Proceedings 300 (AIP, New York, 1994), p. 289, hep-ph/9305255. Astrophysical Solutions are Incompatible with the Solar Neutrino Data (with S. Bludman and N. Hata), Phys. Rev. D49, 3622 (1994), hep-ph/9306212. Editor of Precision Tests of the Standard Electroweak Model, (World, Singapore, 1995), and articles on pp 1, 15, 883. The Strong Coupling, Unification, and Recent Data (with N. Polonsky), Phys. Rev. D52, 3081 (1995), hep-ph/9503214. Big Bang Nucleosynthesis in Crisis (with N. Hata, R. Scherrer, G. Steigman, D. Thomas, T. Walker, and S. Bludman), Phys. Rev. Lett. 75, 3977 (1995), hep-ph/9505319. Implications of Abelian Extended Gauge Structures From String Models (with M. Cvetic), Phys. Rev. D54, 3570 (1996), hep-ph/9511378. Phase Transitions and Vacuum Tunneling Into Charge and Color Breaking Minima in the MSSM (with A. Kusenko and G. Segre), Phys. Rev. D54, 5824 (1996), hep-ph/9602414. Electroweak Breaking and the Mu Problem in Supergravity Models with an Additional U(1) (with M. Cvetic, D. A. Demir, J. R. Espinosa, and L. Everett), Phys. Rev. D56, 2861 (1997), hep-ph/9703317. Solutions to Solar Neutrino Anomaly (with N. Hata), Phys. Rev. D56, 6107 (1997), hep-ph/9705339. Z' Physics and Supersymmetry (with M. Cvetic), in Perspectives on Supersymmetry, ed. G. Kane (World, Singapore, 1998), p312, hep-ph/9707451. Revised version in the reprinted edition, 2010. Classification of Flat Directions in Perturbative Heterotic Superstring Vacua with Anomalous U(1) (with G. Cleaver, M. Cvetic, J. R. Espinosa, and L. Everett), Nucl. Phys. B525, 3 (1998), hep-th/9711178. Editor (with M. Cvetic), SUSY '97, Proceedings of the Fifth International Conference on Supersymmetries in Physics, Nucl. Phys. B (Proc. Suppl.) 62 (1998) (North Holland, 1998). Physics Implications of Flat Directions in Free Fermionic Superstring Models I: Mass Spectrum and Couplings (with G. Cleaver, M. Cvetic, J. R. Espinosa, L. Everett, and J. Wang), Phys. Rev. D59, 055005 (1999), hep-ph/9807479. Physics Implications of Flat Directions in Free Fermionic Superstring Models II: Renormalization Group Analysis (with G. Cleaver, M. Cvetic, J. R. Espinosa, L. Everett, and J. Wang), Phys. Rev. D59, 115002 (1999), hep-ph/9811355. Flavor Changing Effects in Theories with a Heavy Z' Boson with Family Non-Universal Couplings (with M. Pluemacher), Phys. Rev. D62, 013006 (2000), hep-ph/0001204. Editor, Neutrinos in Physics and Astrophysics: From 10−33 to 10+28 cm, (Proceedings of TASI-98), (World, Singapore, 2000). Implications of gauge unification for time variation of the fine structure constant (with G. Segre and M. J. Strassler), Phys. Lett. B 528, 121 (2002), hep-ph/0112233. The Z−Z' Mass Hierarchy in a Supersymmetric Model with a Secluded U(1)' -Breaking Sector (with J. Erler and T. Li), Phys. Rev. D 66, 015002 (2002), hep-ph/0205001. Phenomenology of A Three-Family Standard-like String Model (with M. Cvetic and G. Shiu), Phys. Rev. D 66, 066004 (2002), hep-ph/0205252. No-go for detecting CP violation via neutrinoless double beta decay (with V. Barger, S. L. Glashow, and D. Marfatia), Phys. Lett. B 540, 247 (2002), hep-ph/0205290. Primordial nucleosynthesis constraints on Z' properties (with V. Barger and H. S. Lee), Phys. Rev. D 67, 075009 (2003), hep-ph/0302066. Dynamical supersymmetry breaking in standard-like models with intersecting D6-branes (with M. Cvetic and J. Wang), Phys. Rev. D 68, 046002 (2003), hep-th/0303208. Electroweak baryogenesis in a supersymmetric U(1)' model, (with J. Kang, T. j. Li, and T. Liu), Phys. Rev. Lett. 94, 061801 (2005), hep-ph/0402086. The Higgs sector in a U(1)' extension of the MSSM, (with T. Han and B. McElrath), Phys. Rev. D 70, 115006 (2004), hep-ph/0405244. D6-brane splitting on type IIA orientifolds, (with M. Cvetic, T. J. Li, and T. Liu), Nucl. Phys. B 709, 241 (2005), hep-th/0407178. Neutrino physics (theory), ICHEP 2004, ed. H. Chen et al., (World Singapore, 2005), p198, hep-ph/0411116. Neutrino masses in supersymmetric SU(3)C ×SU(2)L ×U(1)Y ×U(1)' models, (with J. H. Kang and T. J. Li,), Phys. Rev. D 71, 015012 (2005), hep-ph/0411404. Z' discovery limits for supersymmetric E(6) models, (with J. Kang), Phys. Rev. D 71, 035014 (2005), hep-ph/0412190. Toward realistic intersecting D-brane models, (with R. Blumenhagen, M. Cvetic, and G. Shiu), ARNPS 55, 71 (2005), hep-th/0502005. Massive neutrinos and (heterotic) string theory, (with J. Giedt, G. L. Kane, and B. D. Nelson), Phys. Rev. D 71, 115013 (2005), hep-th/0502032. Elementary Particles in Physics (with S. Gasiorowicz), in Encyclopedia of Physics, Third Edition, ed. R. C. Lerner and G. L. Trigg, (Wiley-VCH, 2005), p671. Higgs sector in extensions of the MSSM, (with V. Barger, H. S. Lee and G. Shaughnessy), Phys. Rev. D 73, 115010 (2006), hep-ph/0603247. Neutralino signatures of the singlet extended MSSM (with V. Barger and G. Shaughnessy), Phys. Lett. B 644, 361 (2007), hep-ph/0609068. Collider signatures of singlet extended Higgs sectors (with V. Barger and G. Shaughnessy), Phys. Rev. D 75, 055013 (2007), hep-ph/0611239. TeV physics and the Planck scale (with V. Barger and G. Shaughnessy), New J. Phys. 9, 333 (2007), hep-ph/0702001. A T-odd observable sensitive to CP violating phases in squark decay (with G. Paz, L. T. Wang and I. Yavin), JHEP 0707, 055 (2007), hep-ph/0702068. LHC Phenomenology of an Extended Standard Model with a Real Scalar Singlet, (with V. Barger, M. McCaskey, M. J. Ramsey-Musolf and G. Shaughnessy), Phys. Rev. D 77, 035005 (2008), 0706.4311 [hep-ph]. Theory and Phenomenology of Exotic Isosinglet Quarks and Squarks, (with J. Kang and B. D. Nelson), Phys. Rev. D 77, 035003 (2008), 0708.2701 [hep-ph]. Z' -mediated Supersymmetry Breaking, (with G. Paz, L. T. Wang and I. Yavin), Phys. Rev. Lett. 100, 041802 (2008), 0710.1632 [hep-ph]. Dirac Neutrino Masses from Generalized Supersymmetry Breaking, (with D. A. Demir and L. L. Everett), Phys. Rev. Lett. 100, 091804 (2008), 0712.1341 [hep-ph]. The Physics of Heavy Z' Gauge Bosons, Rev. Mod. Phys. 81, 1199 (2008), 0801.1345 [hep-ph]. Aspects of Z' -mediated Supersymmetry Breaking, (with G. Paz, L. T. Wang and I. Yavin), Phys. Rev. D 77, 085033 (2008), 0801.3693 [hep-ph]. D-Instanton Generated Dirac Neutrino Masses, (with M. Cvetic), Phys. Rev. D 78, 066012 (2008), 0803.2876 [hep-th]. Electroweak Physics, (with J. Erler), Acta Phys. Polon. B 39, 2595 (2008), 0807.3023 [hep-ph]. Complex Singlet Extension of the Standard Model, (with V. Barger, M. McCaskey, M. Ramsey-Musolf and G. Shaughnessy), Phys. Rev. D 79, 015018 (2009), 0811.0393 [hep-ph]. Scalar Potentials and Accidental Symmetries in Supersymmetric U(1)' Models, (with G. Paz and I. Yavin), Phys. Lett. B 671, 245 (2009), 0811.1196 [hep-ph]. Introduction to the Standard Model and Electroweak Physics, Proceedings of TASI-08, The Dawn of the LHC Era, ed. Tao Han (World, Singapore, 2010), p 3, 0901.0241 [hep-ph]. Family Non-universal U(1)' Gauge Symmetries and b − > s Transitions, (with V. Barger, L. Everett, J. Jiang, T. Liu and C. Wagner), Phys. Rev. D 80, 055008 (2009), 0902.4507 [hep-ph]. Improved Constraints on Z' Bosons from Electroweak Precision Data, (with J. Erler, S. Munir and E. R. Pena), JHEP 0908, 017 (2009), 0906.2435 [hep-ph]. b − > s Transitions in Family-dependent U(1)' Models, (with V. Barger, L. Everett, J. Jiang, T. Liu and C. Wagner), JHEP 0912, 048 (2009), 0906.3745 [hep-ph]. Six-lepton Z' resonance at the LHC, (with V. Barger and H. S. Lee), Phys. Rev. Lett. 103, 251802 (2009), 0909.2641 [hep-ph]. The Physics of New U(1)' Gauge Bosons, Proceedings of SUSY09, AIP Conf. Proc. 1200, 55 (2010), 0909.3260 [hep-ph]. Combining Anomaly and Z' Mediation of Supersymmetry Breaking, (with J. de Blas, G. Paz and L. T. Wang), JHEP 1001, 037 (2010), 0911.1996 [hep-ph]. Electroweak Baryogenesis, CDM and Anomaly-free Supersymmetric U(1)' Models, (with J. Kang,T. Li and T. Liu), JHEP 1104, 097 (2011), 0911.2939 [hep-ph]. Z' Physics at the LHC, 0911.4294 [hep-ph], in Hunt for New Physics at the Large Hadron Collider, ed. P. Nath and B. Nelson, Nucl. Phys. Proc. Suppl. 200-202, 185 (2010), 1001.2693 [hep-ph]. Phenomenological Implications of Supersymmetric Family Non-universal U(1)' Models, (with L. L. Everett, J. Jiang, and T. Liu), Phys. Rev. D 82, 094024 (2010), 0911.5349 [hep-ph]. The Standard Model and Beyond (CRC Press, New York, 2009). The Weinberg Operator and a Lower String Scale in Orientifold Compactifications, (with M. Cvetic, J. Halverson, and R. Richter), JHEP 1010, 094 (2010), 1001.3148 [hep-th]. Precision Constraints on Extra Fermion Generations, (with J. Erler), Phys. Rev. Lett. 105, 031801 (2010), 1003.3211 [hep-ph]. Singlet Extensions of the MSSM in the Quiver Landscape, (with M. Cvetic and J. Halverson), JHEP 1009, 076 (2010), 1006.3341 [hep-th]. Sterile Neutrinos - A General Introduction, to be published in A White Paper on keV Sterile Neutrino Dark Matter, (A. de Gouvêa et al.). Z' Bosons at Colliders: a Bayesian Viewpoint, (with J. Erler, S. Munir, and E. Rojas), JHEP 1111, 076 (2011), 1103.2659 [hep-ph]. Impact of extra particles on indirect Z' limits, (with F. del Aguila, J. de Blas, and M. Perez-Victoria), Phys. Rev. D 84, 015015 (2011), 1104.5512 [hep-ph]. A Higgsophilic s-channel Z' and the CDF W+2J Anomaly, (with J. Fan, D. Krohn, and I. Yavin), Phys. Rev. D 84, 105012 (2011), 1106.1682 [hep-ph]. Requiem for an FCHAMP? Fractionally CHArged, Massive Particle, (with G. Steigman), Phys. Rev. D 84, 065040 (2011), 1107.3131 [hep-ph]. Implications of String Constraints for Exotic Matter and Z' s Beyond the Standard Model, (with M. Cvetic and J. Halverson), JHEP 1111, 058 (2011), 1108.5187 [hep-ph]. Neutrino Masses from the Top Down, Ann. Rev. Nucl. Part. Sci. 62, 215 (2012), 1112.5992 [hep-ph]. Electroweak Model and Constraints on New Physics (with J. Erler), in 2012 WWW update for 2012 edition of Review of Particle Properties, (URL: http://pdg.lbl.gov/). Print edition: J. Beringer et al. [Particle Data Group], Phys. Rev. D 86, 010001 (2012). Light Sterile Neutrinos and Short Baseline Neutrino Oscillation Anomalies, (with J. Fan), JHEP 1204, 083 (2012), 1201.6662 [hep-ph]. Light Sterile Neutrinos: A White Paper, (K. Abazajian et al. ), 1204.5379 [hep-ph]. Ultraviolet Completions of Axigluon Models and Their Phenomenological Consequences, (with M. Cvetic and J. Halverson), JHEP 1211, 064 (2012), 1209.2741 [hep-ph]. Grand unification, review article on Scholarpedia 7, 11419 (2012). Exploring Quantum Physics at the ILC, (with A. Freitas, K. Hagiwara, S. Heinemeyer, K. Moenig, M. Tanabashi and G. W. Wilson), 1307.3962 [hep-ph]. Diagnosis of a New Neutral Gauge Boson at the LHC and ILC for Snowmass 2013, (with T. Han, Z. Liu and L. -T. Wang), 1308.2738 [hep-ph]. Study of Electroweak Interactions at the Energy Frontier, (M. Baak et al. ), 1310.6708 [hep-ph]. New Particles Working Group Report of the Snowmass 2013 Community Summer Study, (Y. Gershtein et al. ), 1311.0299 [hep-ex]. Baryon Number Violation, (K. S. Babu et al. ), 1311.5285 [hep-ph]. Neutrino Mass and Mixing, December, 2014. Update of Section 7.7 of The Standard Model and Beyond (CRC Press, New York, 2009). The Higgs, December, 2014. Update of Section 7.5 of The Standard Model and Beyond. Review Of Particle Physics (C. Patrignani et al. [Particle Data Group]), Chin. Phys. C 40, 100001 (2016), (URL: http://pdg.lbl.gov/). String Consistency, Heavy Exotics, and the 750 GeV Diphoton Excess at the LHC, (with M. Cvetic and J. Halverson), Fortschr. Phys. 64, 748 (2016), 1512.07622 [hep-ph]. Sterile Neutrinos - A General Introduction, in A White Paper on keV Sterile Neutrino Dark Matter, (M. Drewes et al. ), J. Cosm. Astroparticle Phys. 01, 025 (2017), 1602.04816 [hep-ph]. Physics Behind Precision, (P. Azzi et al. ), 1703.01626 [hep-ph]. Can the Laws of Physics be Unified? (Princeton University Press, March 2017). The Standard Model and Beyond, Second Edition (CRC Press, New York, 2017). TASI Lectures on Remnants from the String Landscape (with J. Halverson), in TASI 2017, JPoS TASI 2017, 019 (2018), 1801.03503 [hep-th]. Conference Summary and Outlook: Particle Physics Past, Present, and Future, in ICHEP 2018, 1811.07396 [hep-ph]. Constructing the Theory of the Standard Model (with M. K. Gaillard), Physics Today 72, #2, p. 52 (2019). CV: HTML, PDF, condensed HTML, condensed PDF. On 13 Feb 2019, 09:16.